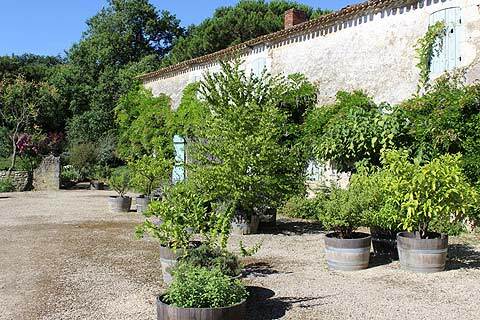 The Jardins de Sardy are in the Dordogne department in the region of Aquitaine in SW France. They are close to Sainte-Foy-la-Grande between Bergerac and Bordeaux. On entering the Jardins de Sardy you first enter a pretty courtyard surrounded by various buildings of the Sardy estate. These pretty buildings of pale stone with terracotta roofs and pale blue shutters surround three sides of the courtyard whilst the fourth draws you towards views of the garden below. 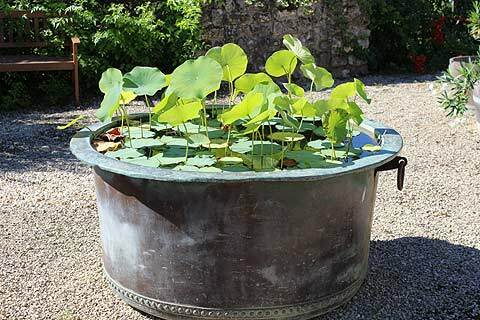 The courtyard itself is large and covered with various plants in barrels as well as a large planter filled with lotus plants. From the edge of the courtyard are some excellent views down over the garden below. 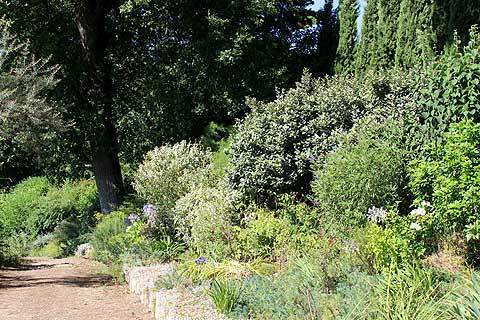 A gravel path winds down next to the steep slope at the edge of the garden. This is planted with mostly in colours of silver, green and blue. At the end of the path is a large hornbeam and a statue of Saint Flacre set on its roots. 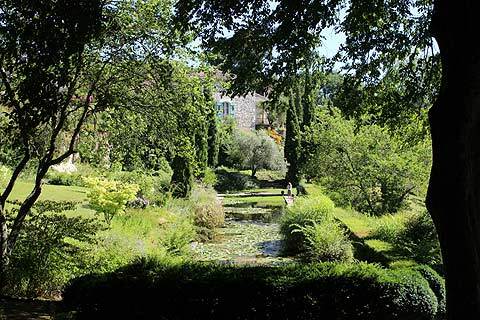 Steps lead up to a viewpoint and a shady spot where you can contemplate the garden at your leisure. The highlight of the garden is its magnificent formal pool. This is one of the most attractive we have seen in any garden. 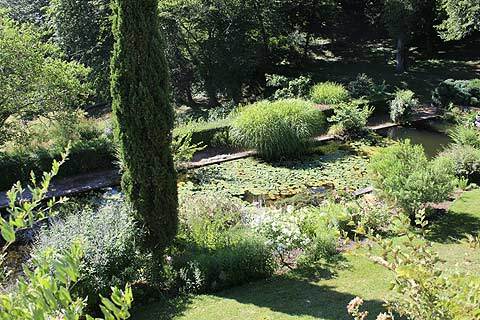 A huge rectangular pool filled with water-lilies and Koi-carp and edged with arum lilies and a number of shrubs which overhang and whose branches touch the water it is lovely. When the fountains are turned on it is sensational. 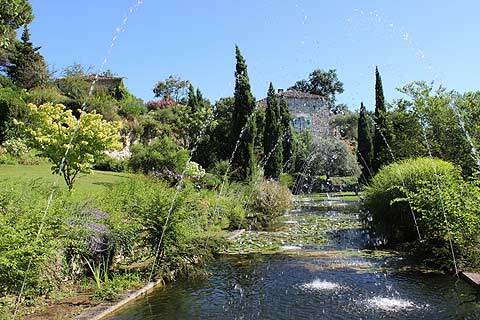 Further parts of the garden lead to olive groves and intricate topiary but it is the view of the pool that will draw you back again and again. As you return to the courtyard take a look at the exhibition of photos in one of the buildings. This shows the development of the gardens over the years. When you have finished wandering round the garden there is a lovely tea room overlooking the gardens where you can enjoy tea and biscuits or an ice-cream. You can even buy a bottle of Sardy's own wine. The beautiful town of Saint-Emilion with its troglodyte church and world-famous wines is nearby. Bordeaux is a wonderful city and its historic centre now has UNESCO World Heritage status. Be sure to visit the Bordeaux waterfront area too.